Mobile network service providers have been eagerly planning for the launch of 5G service deployment. 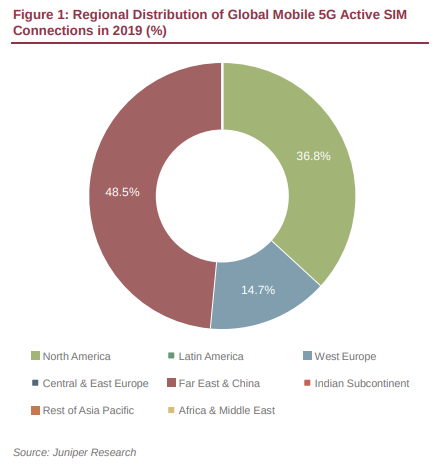 Juniper Research anticipates that the first commercial network launches will occur in 2019 -- the initial networks to provide 5G services will be located within the Far East & China and North America regions. Meanwhile, network operators in Europe have mostly adopted a wait-and-see approach, closely following the progress of operators in the two leading regions. Over the past two years, telecom service providers and network equipment vendors have been actively trialing 5G infrastructure components. Juniper believes that these substantial revenues will offer relief to the telecom service providers experiencing declining revenues and profitability. That said, Juniper analysts forecast that 5G service revenues will be 38 percent of total operator billed revenues by 2025, despite the anticipated 1.5 billion 5G connections accounting for 14 percent of all cellular connections in the same year. According to the Juniper assessment, network operators must optimize pricing strategies and network configuration to secure a return on their 5G investment. Given the variety of internet of things (IoT) devices that will use 5G, pricing strategies must reflect data usage, device type and required network speeds to ensure profitability. Juniper also forecasts that the total data traffic generated by 5G connections will reach 955 Exabytes annually by 2025. Network operators will likely need to implement technologies that minimize the cost-per-bit of 5G data -- including network virtualization -- to provide on-demand network agility for the data-intensive demands of 5G connections. "5G for home broadband services will be the biggest driver in the growth of cellular traffic after initial launches," said Sam Barker, senior analyst at Juniper Research. "By 2025, the average 5G home broadband connection will generate over 430GB of data per month." In addition, the researchers estimated that cumulative 5G research and development spending by network operators, hardware vendors and public bodies will approach $60 billion by the end of 2018. In 2018 alone, it is anticipated that telecom service providers will invest nearly $30 billion to deploy and test networks in preparation for commercial launches in 2019.